Did you know that you could merge 2 similar fan pages on FB if you were the admin to both? I did not know this until a couple days back and the reason for my research was the confusion i was having on how to manage multiple Facebook fan pages as a startup. When I started Satthwa, I started with just 1 product, which was the Premium Hair Oil and at that time, it did not make sense to start a “Satthwa” facebook page as my niche was only men and women looking to stop their hair fall and and regrow hair. It made more sense to start a niche facebook page and that was Hair Treatment Now. Fast forward one year and now since a few more products have been launched under Satthwa, there was a need to create a dedicated fan page. But there comes a challenge, updating 2 pages with quality content and then trying to grow both their fan bases is a difficult and time consuming job, especially for a bootstrapped startup. My research lead me to the possibility of merging my fan pages and keeping only Satthwa Facebook Page as the main option.. makes sense as that is the brand page. However after careful consideration, I decided against this. When you merge 2 pages, you loose all timeline content on the one which is being merged. In my case, I would have lost all content on the Hair Treatment Now page and since this page is a year old and has a large following, I opted against this. I would have made much more sense if FB let the timeline content as is and merged the page. Anyways, for someone who want to do this, below are some screen shots which will point you how to get this done. On this step, the first option you would need to select the page you want to stay and the second which will be merged to the first. Back in 2016, almost exactly around this time I was working on launching the Satthwa Premium Hair oil. Since that was my very first product launch, I did not keep my expectations high, knowing very well that I was going to compete with the biggies in one of the most competitive categories. It has now been a year since the launch, the sales and feedback Satthwa hair oil have got from the users has FAR exceeded my wildest dreams. I am very grateful for the same. Within this one year, there were many times when I was told that in order for a brand to “succeed”, you need multiple products and though I think that this might be true to a certain extent, back then I did not want to divide my bandwidth by launching multiple products. Launching multiple products and hoping that each generates enough sales to sustain the business is a bad idea in my opinion. I want all my products to be the star products in their respective category because so much learning and research goes into each. I really don’t see the point of launching a run of the mill brand, there are plenty of those already. Since the last few months, I have been researching on other products. Something which complements the hair oil as well. This got me to researching on Essential Oils and the first choice for the launch was Lavender Essential oil. Adding a few drops of lavender essential oil to any carrier oil helps in blood circulation on the scalp and apart from this, lavender oil has so many other benefits as well. Not to forget, this is an excellent oil for aromatherapy. So without further ado, Satthwa Lavender Essential Oil has now been launched! Content spamming, it’s 2017 for god sakes! 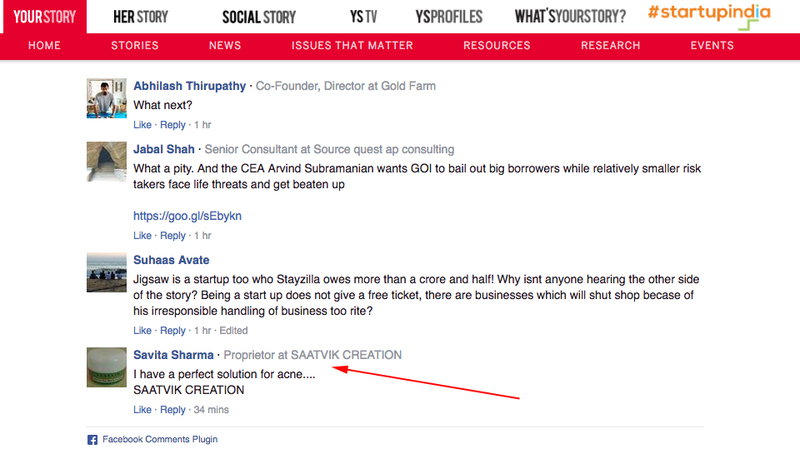 Was reading an article about Stayzilla and the issues being faced by startups and how things get personal when a startup goes bust. To a certain extent i agree that crazy valuations and funding pushes founders to a “think once and spend twice” mentality but that the same time, i don’t see why things should get personal… to the extent of getting death threats. Anyways, as i was reading the comments on the article, i noticed that people in 2017 are still doing spam commenting, how they hell do they expect to do anything other than downgrading their own product? Jeevansathi gives us a wtf moment! The usual practice is that singles look for other singles on matrimonial websites but in a new twist, Jeevansathi has introduced search for married people also… yes! you read that right. You can now filter from Never Married, Divorced, Annulled, Awaiting Divorce, Widowed and MARRIED. Is this a April fools joke done a little early?